A great weekend but started with the bad news that Jimmy Bruno couldn’t make it but at the 11th hour the talented Adrian Ingram stood in which was a more than worthy replacement! After the Friday welcoming and teaching session there was a concert featuring the amazingly talented guitar wizard Gary Potter which was a feast for guitarists and music fans alike. The embedded clip is of the first 10 mins of the concert. Saturday started over at the University with the teaching and we set our stall up with a small selection of our stock and we were pleased at the enthusiastic response from everyone; it also gave us a chance to catch a few words with some of our past customers and potential future customers! There was a Student Jam session at lunchtime which almost everyone participated. Ably helped along by the solid rhythm section which included Bill Coleman and Andy Hulme it was great that there were no egos, no criticism, just solid encouragement and applause which I think is one of the best features of the whole event; the fact that it is an inclusive event which aims to get everyone playing and more importantly enjoying the sometimes bewildering world of jazz guitar. For anyone reading this who is thinking about attending this event in the future than my advice from myself is to go for it! As far as I can see it’s pretty much a unique event in the UK jazz guitar calender that gets people travelling from all over Britain and from Europe too. 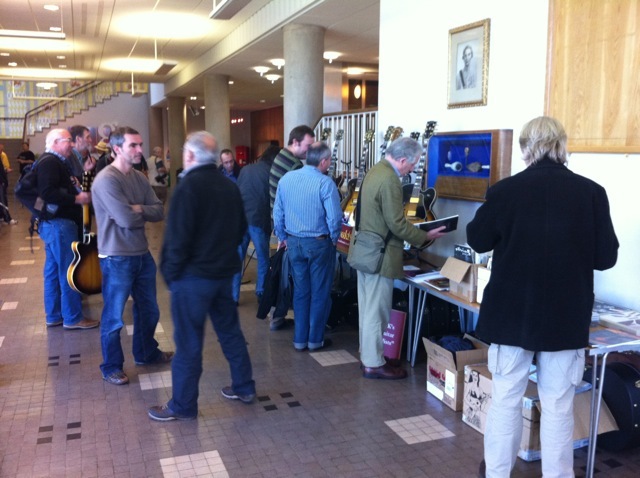 You’ll meet with like minded musicians and swap stories and info about equipment and you never know you might find the other part of the jazz guitar duo you always wanted to play in! 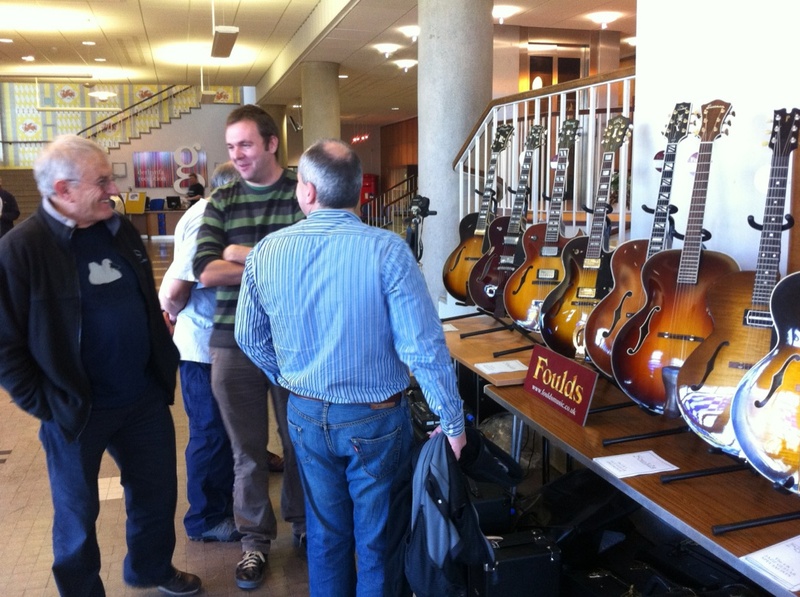 That afternoon there was a session on guitar setups and maintenance from the reputed guitar luthier Trevor Jones, another useful part of the event. Later that evening there was a concert which featured the great Dave O’Higgins, Bill Coleman, Adrian Ingram, Trefor Owen and Andy Hulme and was a fitting end to a great day. It brings it home to you when you see these guys (who’ve probably never played together before) just how great they are at putting on a show and they effortlessly played standard after standard; top notch stuff. We had to leave on the Sunday early but there is another teaching session in the morning before the weekend draws to a close. A very special thank you should go to Trefor Owen and Maureen Hopkins who puts this whole thing together, without their tireless effort drive and enthusiasm the UK scene would be much worse off. I’m happy to say there are plans afoot for another event with another US jazz guitar star next year…See www.northwalesjazz.org.uk for details of future events and do yourself a favour- get yourself along! 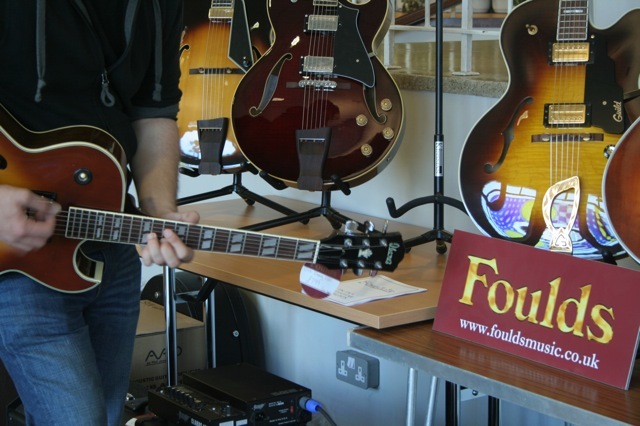 We’re looking forward to this event as it is always one of the best events in the UK jazz guitar calender. This year is featuring the legendary Jimmy Bruno as the guest tutor which promises to be a real treat. There’s a host of gigs happening over the weekend from an informal jam to the concerts featuring Gary Potter and the Saturday night concert which is Jimmy Bruno as well as Trefor Owen. It also features the fantastic Dave O’Higgins on sax who is a bona fide UK sax legend!. 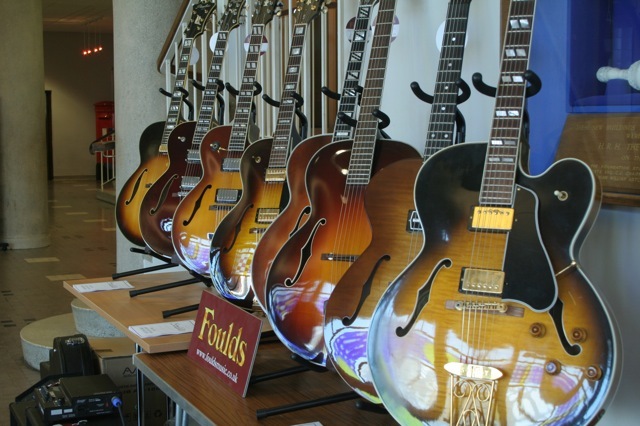 Foulds are supporting the event and will be there with a small selection of guitars, accessories and magazines.